Yooralla is committed to supporting individuals with disability to engage in meaningful employment. We understand that this is more than just having a job. It’s about working alongside other members of the community in roles that are valued and contribute in a positive way. Yooralla actively explores partnerships with businesses in our communities, to create opportunities for people with disability to work with an employer to develop new skills, build social networks and be a part of the wider community, whilst earning a wage. If you want to work but you’re not ready to work without support, Yooralla also provides job skills and employment pathways and supported employment opportunities to help prepare you for open employment in the future. 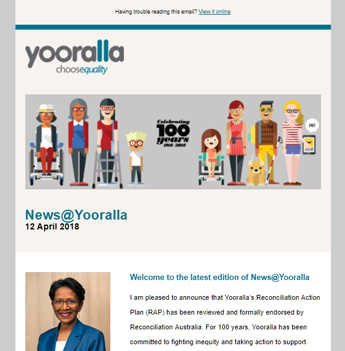 Learn more about Yooralla’s employment pathways.